Meet Reshmi of Rasoi in the Budding blogger series..
Everyone has a personal reason for cooking and special people to cook for. For me, cooking is all about entertaining & that means enjoying delicious food with family and friends. And all that starts in "Rasoi". I'm Reshmi, a student from Los Angeles, USA. I was born & raised in Bhilai, Central India. I have been to different parts of India, stretching from North to all the way to the southernmost tip. This gives me all kinds of reasonable authority on food. I'm not much into eating. Rather it is simply awesome to see people enjoy the food I have prepared & then to see a perfect look of satisfaction on their faces. That's it!! My interest in cooking started when I got married. I've spent the last two years in cooking and blogging about cooking as well. I love to cook every day something new for my better half. On my husband's suggestion I got around to creating a blog that focuses on food, recipes and healthy diets. And to share my taste, research, experiments & findings, Rasoi was born. I love sharing all that I have learned. The sources of my recipes are - my mother, Internet, Magazine, TV shows, Cookbooks, friends and ofcourse, my own experiments. All I want to say is "Cooking is a wonderful life"!! Grease the idli plates with a bit of oil and pour a ladle full of batter into the plates. Steam the idlis in the cooker. After a few minutes, pierce the back of a small spoon to check if it comes out clean...else steam cook for a few more minutes. Serve hot with spicy sidedish. 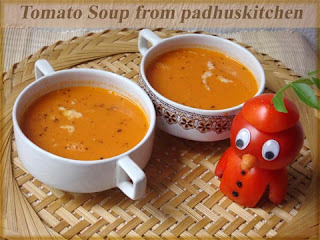 Meet Padhu of Padhu's kitchen this week's edition of Sunday super blogger series. She has a collection of more than 200 recipes in about a year and half of blogging. The pictures and garnishings on her recipes are eye catching. Read more to know about her while she shares some interesting and useful tips about garnishing which makes food a visual treat. Padhu : An optimistic and a creative person, mother of 2 adorable children and a person with diverse interests willing to explore ideas and learn something new. My inquisitive mind has made me venture into various fields like waste management, art & crafts, organic gardening, Beauty, cooking, Yoga, web designing etc. I started my first website on Health and Beauty Tips in early 2007 which focuses on Natural Health & Beauty Care. I have also conducted hobby classes and art camps for women and children and my most unforgettable experience was conducting craft camp for the special children. With respect to managing job and family, my family has always been my priority. Being a self employed woman, I am able to adjust the timings to suit my needs. Mostly I work after my kids leave and make it a point to be with them when they are back. My food blog was started in August 2009. I make it a point to post once or sometimes twice a week. I do not cook specially for the blog but only post recipes of what I cook for my family. But I do bake specially for the blog. Padhu : My children used to appreciate and love my cooking very much. In order to make them happy, I started cooking variety of dishes for them. They loved it very much. I wanted to maintain an online diary of those recipes tried and tested in my kitchen, so that they could refer later, when they settle down elsewhere. Thus Padhuskitchen was born. What started as a hobby has become a passion now. EC: What changes has blogging brought in your life ? Padhu : Although I have attended baking classes before marriage, being a fitness freak I have never shown much interest in it. But now after seeing all the blogs with so many cakes and muffins, I am tempted to bake now. I have learnt many things about international cuisine and baking. It is nice to keep in touch with people of same interest. Padhu : Thank you very much for your compliments. At present I am using a Sony DSC –T20/T25. When it comes to food photography, I am just a beginner. I make it a point to click pictures during day time in natural light and never use flash. For me more than food photography, I love food art, fruit and vegetable carvings and food presentation. I feel presentation of food is as important as taste and smell. I will share with you a few tips on garnishing from my experience. First of all you don’t have to be a chef or an expert in the field to make garnishes, anyone can do it. 1. Make sure your garnish matches with your dish. Use only the ingredients you have used in the dish for garnishing. For e.g. you can garnish carrot rice with 2-3 simple carrot flowers. 2. Make it as simple as possible. Do not over do it or clutter the plate with decorations. A simple tomato rose garnish for a raitha or salad makes it look appealing. A colorful plate looks pleasing and inviting to the eyes. For salads, you can mix carrot (orange), tomatoes (red) and green bell peppers to make it look attractive. Just sprinkling coriander leaves over tomato rice makes it look colorful. 4. Fruit salads can be kept in a melon basket or a pineapple boat at the centre of the table. 5. As far as possible use edible garnishes. 6. Use white plate for colorful dishes and a colored plate for light colored dishes. 7. You can cut vegetables and fruits into different shapes using cookie cutter and serve to make it more attractive. With little imagination anyone can make the food look presentable and attractive. EC: Tell us about your "How to" series. What are your recipe sources and plans for your blog for the year? Padhu : “How to” series was mainly meant for a novice who has never tried cooking before. I also have plans to share very simple and basic recipes. Most of the recipes in my blog are passed on to me by my mother and aunty. Some of them are from friends, neighbours, TV shows and magazines. I love traditional food very much and I feel it is losing its importance now a days. So I want to bring back traditional recipes, festival recipes and also have plans to post quick and healthy Indian recipes which can be prepared in a jiffy during the morning hectic hours. EC: Can you give some tips for new bloggers to make their blogs popular? Padhu : Have your own style, stay focused and most important is you must have passion and interest and of course persistence is also required. Thank you so much EC for giving me this opportunity. I feel honored. I was featured as a budding blogger in your site 1 1/2 years back, now I feel so elated on being featured as a Super Blogger in the very same site. I am a home maker from chennai. I was intersted in cooking from childhood. Recently when i was browsing the net and looking for recipes I got interested in writing a blog myself. I thought it would be very useful for my daughters and others as well. The recipes in my blog are all the ones that I have tried out at my home. Most of my recipes are the ones that I have learnt from my mother, mother in law and some of them from friends and other blogs. The recipes are all simple Indian vegetarian food. I am trying to post lot of traditional recipes that we cook in our home as part of our day to day cooking. Of course I will be posting a lot of sweets and savories in the course of time cooked during each festival which would help lot of people who are away from home. I am also trying out various recipes from other blogs and of course trying out recipes from across the world like Italian pasta,pizza,Chinese noodles and cooking it to our Indian taste. Apply butter to the bread slices. Spread the grated carrot, onions and coriander on the bread slice. Sprinkle salt and chaat masala as required. Spread a layer of grated cheese over it. Cover it with another slice of bread and toast till golden brown. Serve hot with sauce. Meet Sharmilee of Sharmis passion this week in the Super blogger series. She has a collection of more than 180 recipes posted over a period of 2 years. The pictures on her blog are very beautiful and would tempt any reader to grab some of the delicacy from the screen itself. Apart from telling us about herself and her blog, Sharmilee also shares some interesting and useful tips about baking and food photography..
Attimes it is tough to allot time for clicking with the 1.5 yr old hyperactive kiddo but still with my family's support and my passion for food photography it gets going. I struggle to take things at the last minute....So I usually preplan things and have atleast 10-15 posts in drafts. So its easy to post in different categories and I try to post atleast twice a week. The main reason for me to start a food blog was the passion towards food photography and secondly I can say I wanted to have a record of all the traditional and new recipes with proper measurements. The first thing I do in the morning is check my dashboard and it brings a wide smile on my face when there are comments waiting for me to be moderated. EC: Who and what inspired you to start food blogging ?? Which food blogs inspire you ? Sharmilee: Once when I was searching for a recipe and that was the first introduction to food blogs to me. When I was in my 2nd trimester I wanted some distraction apart from my job so chose to create a food blog as I was keen in feeding healthy and tasty food for my family. 1. Never use flash especially when food photography is considered. satisfactory I try to make the dish another time for clicking sake because first I should like my pic before presenting it to others. 3.Always keep the food near by a window where the light is neither harsh or dull. Take the food in different angles and take more pictures and choose the best. Sharmilee: I am still a beginner in baking. Will you believe I bought an oven only after Sharmis Passions was born and yes I bought it specially for my blogs sake and of course now my family enjoys my baked goodies too. I would suggest Simple Moist chocolate cake without eggs as this is the top popular posts in my blog and also many of my readers and friends have tried this and have given me good feedback. Always start with small measurements as I still follow that. And try to stick to the orginal recipe for few trials then experiment on them. Sharmilee : Of course yes I love my identity as Sharmilee from Sharmis Passions and I thoroughly enjoy blogging, cooking and clicking for that sake. I would say that it has made the lazy me cook and try out new recipes as well. And has earned me so many blogger friends worldwide and now few of them are close too. 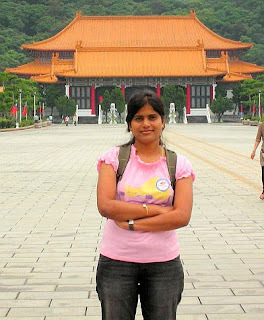 Meet Raksha of Raksha's Kitchen in the Budding blogger series.. I am a software professional with a full time job and a mother to a 2 yr old daughter. I believe that we should make time for ourself and our hobbies. I am born and brought up in a joint family of a cool place named Goa. A typical joint family comprising 25 people. I never cooked food of any type before my marraige as my mom and aunts never allowed me and my cousins to enter the kitchen. A few days before my marraige I learnt a little bit of cooking and I noted down a few things. My mom was very worried as what will I cook and what will I feed my hubby. Soon after marraige I got settled in the Silicon Valley of India - Bangalore. My hubby being a complete foodie always encouraged me to cook. Initially he helped me cook. At that time he knew cooking much much better than me. Gradually, I develped interest in cooking. I started reading lots of cook books and viewing Khana Khazana and other cooking shows on TV. I used to experiment all that I learnt on my hubby and he never critised me. He used to become happy and his happiness encouraged me to cook better. It has been 5 years since I am married and I am proud that I learnt a lot of things and have become a very good cook. I started my food blog which is hardly 1 month old. This new world of blogging has encouraged me to try out new recipies and to exhibit my talent. I also get to learn a lot of things from fellow bloggers. Cooking has become a passion for me since the day I started blogging. Beat the oil and milk well. Add salt to the dough and then the mixture of oil and milk. Add water as required to make a soft dough. Keep covered for atleast hour an hour. Divide into small balls and make rotis of medium thickness and cook on hot tava till brown spots appear. Make a paste of gram flour and water and add it to the peas masala. Heat it to get really thick. Place a little mixture in the center of the roti and roll slowly and tightly. Make a thick paste of wheat flour and water and apply in the corners so that the stuffing does not come out. Heat the roll on the tava for a minute and serve hot. Meet Nivedita of Nivedita's kitchen blog in the Super blogger sunday series..She has a collection of more than 300 recipes in two years of blogging and is still going strong. She is good at so many varied activities and popular in the social networking site too. Read more about her..
Computer is my another baby which I always love to play with and experiment with (done many courses including hardware, I can repair the computer also) now, I Love Blogging :-) My blog is officially started in 2007 but my first post published was in 2009 March :-) I was too scared or lazy or was not sure about my getting success here. I have tried and shared many recipes in my blog Nivedita's Kitchen and tried to share my feelings in another blog Me and my thoughts!! Nivedita: During childhood, cooking was my necessity. Now, there are many people who really inspire me to try cooking new food. My daughter, my blogging friends, great chefs from all over the world are few among them. Nivedita: Yes!! Blogging has really changed my life to the maximum. I have entered the totally new world where I have got wonderful friends. I have become more confident about new cooking, I have taken risks to learn very new things. Blogging has helped me to improve my writing skill. It has given me a wonderful social network. I feel proud to say "I own a blog where I have more than 300 recipes which have been tried and tasted by me." EC: Your views on plagiarism and how can we fight it ? Nivedita: I hate the word "Plagiarism". People who do this are useless. I really get irritated and very angry with those. The original work has to be appreciated and should get the credit. I am not sure about stopping it, But we all together can fight against it by spreading the awareness about Plagiarism in our blogs by blocking that person from entering into any contest and if possible by complaining about that person. EC: How do you manage balancing your job, family and blogging ? Nivedita: Being a working mother of two kids, and presently a single parent (my hubby stays abroad), managing everything from groceries to vehicle servicing, is not an easy task. But, I believe in my own quote "when you are dedicated, you always have time"
EC: You have tried so many variety cuisines...which is the easiest and tasty..also which is your favourite ? Nivedita: Very very tough question. I love everything that is eatable or edible. I really can not decide my favorite, easiest and tasty food. Most of my posts in my blog starts with a sentence "I love this one :-) "
However, I would like to tell about one recipe which is really very easy and very tasty. Its Chapati Poha, which is prepared using left over chapatis. Its yummy, healthy and very tasty food. Nivedita : Again the tough question. Here I don't want to cheat my self. I love to eat anything, my favorite is raw food, believe me, I can stay only salads for many days. I am a twenty year old who comes from a family which loves food. I have always loved food. I started cooking when my mother started working and to make dishes she wouldn't usually make. I baked my first cake at fifteen, and it was a success. Cooking calms me down. I like the concentration that goes into cutting vegetables, weighing and measuring ingredients. It makes calms me down. During exams I barge out of my room, go to the kitchen and whip up something to eat. It was during times like these I tried my hand at baking a casserole, making an egg stir fry and pasta. My love for cooking and baking coincided with my start of a college education. Studying in Mumbai I now had a chance to eat more different kinds of food, and it has helped develop my palate. I notice ingredients now, which I never did before. I got the idea of starting a food blog when a lot my friends started asking me for recipes. I believe it will help me share what I am learning about food. I am a fearless eater and cook. And am learning constantly. Add chopped onions, curry leaves, coriander leaves, ginger paste and tempered mustard seeds, bengalgram dal and black gram dal. Mix well. Pour into hot paniyaram pan and cook on medium flame till cooked and brown spots appear on both sides. ** The batter is same as for bran rice idli and bran rice dosa...So once you grind the batter, you can prepare all the three. Meet Beula of Eaterspot blog in the Budding blogger series..
Eaterspot was born on a weeknight when my husband and I were talking about what to eat for dinner. We were just married, and I had relocated from the US to live here in NZ. Though I work full time, I enjoy cooking after I get home from work each day. I have always been known for having an overly full schedule, so when my husband noticed that I was not repeating a dish each night, he suggested I start a food blog. So on a Thursday night in March 2010 I set up Eaterspot. The blog has recipes that have been part of the family over the years and there are also recipes that I try for the first time. We are non-vegetarians, however I think I have cooked up more vegetarian dishes for eaterspot. I am a foodie and my husband is now a convert too, so in my spare time I enjoy reading recipes and adding them to my collection. Mix chopped onions, plain sev and coriander leaves together. 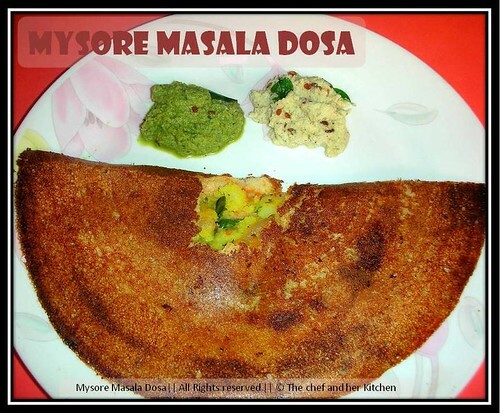 Heat tava and spread the dosa batter to a thick uttappam and then spread the mixture over it. Spread a little oil in the sides. When the bottom starts getting brown, turn over slowly and cook on low flame for a minute. Serve hot with green chutney.